American Home Shield is really hated by their customers. A quick check on their social media accounts shows complaint upon complaint upon complaint. They currently have a 2.8 rating with the BBB. So is American Home Shield a reputable company to use? AHS was sued in 2007 for “engaged in a pattern and practice of failing to fulfill its contractual obligation to its customers.” AHS settled in 2008. The vendors that AHS works with raise some concerns that this is still an ongoing issue. While investigating another fake review spam network, I found a review from Sally Banks. 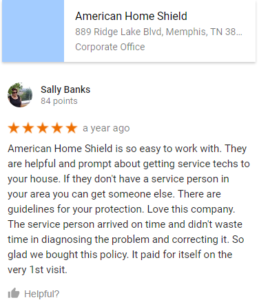 Sally has left a majority of her reviews in Illinois and Tennessee when she wasn’t visiting Miami, Denver, or Delta Utah. I can not find any evidence to support that fact Ms. Banks is real. In fact, the law firm she reviewed, exposed 879 new businesses exchange in review manipulation. The biggest offender is a sister company of American Home Shield too. Immediate Response Plumbing whom we previously identified as having fake reviews. The are several complaints against this company for lack of service, price gouging or claims that the work was not under warranty. Just Plumbing Services Inc has a lot of negative reviews complaining about service and rude staff. Around July 2017, the fake positive reviews started popping up. There are several reviewers that reviewed Immediate Response Plumbing as well. Emergency Maintenance Company also has fake reviews from people that reviewed Immediate Response Plumbing and Just Plumbing Inc.
Do you know of other vendors that need to be added this ongoing list? Please email us so we can get them included. interesting to see this confirmation. the AHS warrante came with the house purchase i didnt pay for it, the sellers did. when i tried to use it 1. the contractor called to reschedule then did not show up. when i called AHS they were not polite. thedy attempted to twist my words. they refused to transfer me to management. they then LIED to the BBB in responding to my complaint all while pretending to resolve the situation with me directly via email. This company is totally unethical and the real estate agencies that push these contracts onto sellers as a way to ‘sweeten the deal’ should be ashamed of themselves for being participants in this SCAM. I guess it is a win-win for you. You didn’t pay for it and the contractor was a no-show. If you remember the name of the contractor, you should look them up to see if they have similar complaints and/ or fake reviews. In my experience, the WORST company EVER! So, two months ago, oven not heating, sent a guy, he yelled at me in front of my daughter, and then, my husband! The oven never did get fixed. The dryer broke, they were going to send same company, I said HELL NO, so they sent a different company. The guy BLEW UP our dryer and our electric circuit. Blamed it on our electricity. SO, they sent an electrician, he fixed it. It blew again, the electrician came again, fixed it, looked and said the dryer is melted inside and that it is burned up and the electric is not the problem and that the dryer has a short in it. I called the owner back and told him the guy he sent ruined the dryer and blew up circuit breaker. The OWNER came and “fixed” the dryer. I did a load of laundry and it BURNED my husbands expensive work clothes. I called the owner, said I was going to call Home Shield. He said I was lucky to have him because someone else would take a minimum of two to three weeks, maybe more, before they would be able to look at my dryer. I told him I was concerned about his guy blowing up my dryer (by the way he didn’t know his employee’s name, he said he goes through them a lot). A guy at my husband’s work said if it had so much electric going through it that the circuit breaker broke and it was melted inside, it would never be the same. So, he “fixed” it again. I did another load of laundry and it BURNED my husband’s other expensive work clothes. NOW, the appliance guy told American Home Shield that he never found any problem with the dryer?! Really?! So, their first guy, over the oven yells at me in my home in front of my daughter and the second guy, who blew up my, still not working dryer, it has now been about a month, said he found nothing wrong with the dryer?! Who are these people they are sending to my house? CRIMINALS? Apparently. THEIR electrician said it was the dryer. NOW, after calling them for a month, having a shady people in my house, they want to have someone else come to my house. I said I really think after everything you have put me through I should have a NEW DRYER, because your guy BLEW mine up and it WASN’T blown up before! AND for ALL of his HORRIBLE, HORRIBLE inconvenience (just got of phone now having ANOTHER guy come to my house)! This has really added a lot of unneeded stress to my life. UPDATE: THEY SENT AN 8TH PERSON AND THEY WERE A NO SHOW AND NEVER CALLED! THEY ONLY HIRE LOW END PEOPLE. WORST COMPANY EVER!! I canceled both of my American home Shield contract because I had so many problems with them one of their vendors or so-called contractors rip me off for $375. No sense in complaining to American home Shield they always have an excuse believe me I know never get mixed up with this company or any of their lowlife contractors .